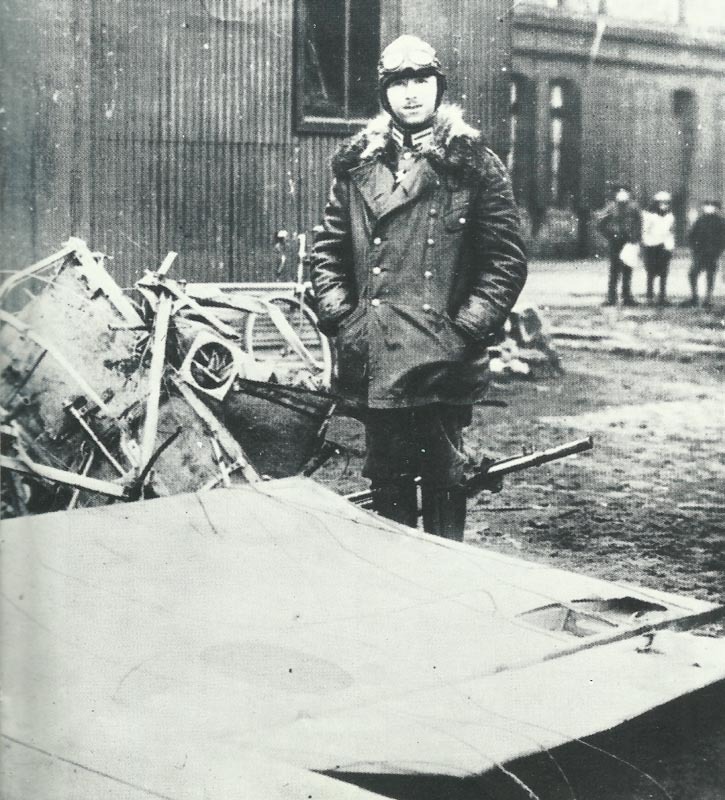 Max Immelmann beside the rubble of his seventh air victory. Western Front – ‘FOKKER SCOURGE’ BEGINS: Im­melmann scores first Fokker EI victory, over Douai, with his first MG burst in anger, wounds British BE2c pilot (1 of 9 raiding airfield) forcing him to land. Im­melmann awarded Iron Cross 1st class. Britain: In August Lt-Col Brooke­-Popham (RFC GSO 1) calls for expansion in prescient memo ‘if the enemy brings troops over from the Eastern Front and resumes his offensive … Then will commence the real struggle for air supremacy where numbers will be one of the essentials for success’, on which advice War Office orders revolutionary light alloy Hispano-Suiza V8 aero engine from France. Admiral Jellicoe demands ‘aeroplane carriers’ for British Grand Fleet. Flanders: British counter­-attack at Hooge. Artois: ­French repulse several attacks with grenades, then occupy trenches in sunken road between Ablain and Angres, north of the Bethune-Arras road. Mortar fire and grenades exchanged near Souchez. Champagne: In Perthes­-Beausejour sector, mining and counter-mining. Argonne: ­Mortars and grenades prepare several vain German infantry assaults at Marie-Therese and St Hubert. Meuse: Between Les Eparges and the Calonne trench, three German attacks on Bois Haut positions, all repulsed by French artillery and MG fire. German incendiary shells fall on Pont-a-­Mousson. During August French infantry first issued with trench knives. Baltic Provinces: Nieme­n-Armee occupies evacuated Mitau but repulsed southwest of there on August 7, 12 and 16. Poland­: Germans held on Blonie line, 15 miles west of Warsaw until August 4. Gallwitz takes Ostrolenka on river Narew on August 3. Serbia: In August Falkenhayn decides to eliminate Serbia. Serbian Army ration strength 572,171. Italian Front: In Carnic Alps Austrian counter-attacks on Mt Medetta repulsed. Syria: During August Djemal hangs 11 Arab leaders after summary trial. East Africa: In August Lettow promoted to colonel. He has 2,217 whites under arms including c. 900 merchant and Imperial Navy sailors. British submarines blow up Galata bridge at Constantinople. Kaiser and Tsar each issue first anniversary war manifestos. During August Britain ob­tains c.32,000 binoculars from Germany for rubber via Swiss intermediary. Britain: Retail Food Price up 2% to 34%. During August Manchester University release Zionist chemist Dr Weizmann to continue his cordite solvents research for Admiralty (until May 1918, patented February 9, 1916). Russia: Re-sitting Duma votes 100% to win war, 35 million roubles for refugees (August 5), and to investigate munition abuses (August 10).